Built in 1926 and originally named the Mansfield Theatre, the Brooks Atkinson Theatre was renamed in 1960 to honor the famed New York Times drama critic, Brooks Atkinson. This intimate playhouse is popular with theatergoers having housed a long list of distinguished dramas and comedies starring such talents as Matthew Broderick, Glenn Close, Richard Dreyfuss, Gene Hackman, Ed Harris, Derek Jacobi, Nathan Lane, Gary Sinise, Kevin Spacey, Jerry Stiller, and Marisa Tomei. Refurbished in 2000, the theatre is once again illuminated by the original chandelier that had been removed over 40 years ago. 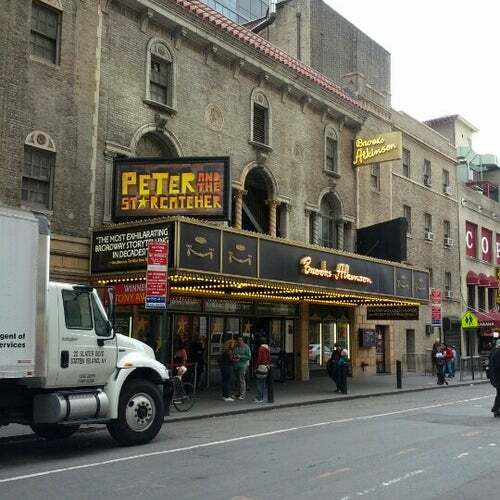 The Brooks Atkinson has 1,069 seats and is one of The Nederlander Organizations nine Broadway theatres.